The One and only photo released of children at SH. Suppose to have happened at 10:47 AM - would have been in front of police dash cam shown below. Never happened in front of dash cam. They were not running, but walking. 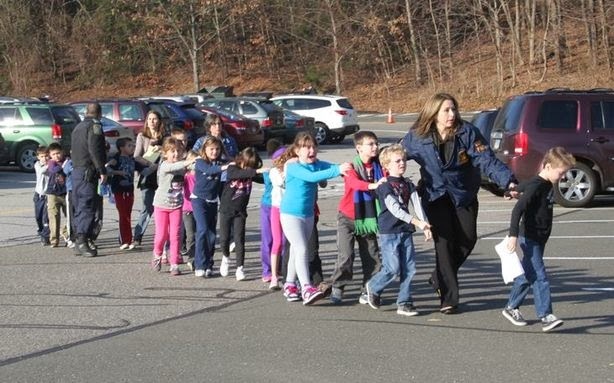 The sad story of Sandy Hook Elementary is that overwhelming evidence of the school shooting was a false flag attack against the nation in what has turned out to be a successful attempt to derail the Second Amendment. It speaks of the unfathomable lengths that this regime will go to in order to thwart the U.S. Constitution and We The People. I realize I am in the vast minority, but only because the vast majority has not looked at all the facts, but merely believe what has been represented in the media. Though I have been suspicious from the onset of the supposed shooting, like I was earlier with the bizarre shooting in a Colorado movie theater, of late I have turned the corner completely and now truly believe this was a hoax. It is hard to admit because there is no doubt I probably sound (more than usual) looney-toon to the uninformed and gullible. There is a Police Dash Cam video of the parking lot of Sandy Hook. I show the official timeline as written out by the Police of what happened and when. The official timeline says they began evacuating the children at 9:58 AM from the school and walking them across the parking lot to the firehouse. The official timeline of the evacuation of children from the school to the Police dash cam. No children are ever seen during the time they should have been going across the lot. Here is the State Police site to view the Police Dash Cam video. There are different times going to 10:03 AM of masses of children being evacuated at one time from the school and going across the lot. The dash cam video has a few redacted seconds, but they are only seconds of time and there would be no way of getting the children across the lot in that amount of time. What bothered me about the Candles in Sotos windows. Video of Police getting lost responding to SH shooting... turns around 4 times and ask people where the school is. Video of school - mold, wires hanging, Windows covered with stuff. Update 3/6/14 - See the Big Difference between Sandy Hook and other school shootings last year.